Is Your Olive Oil Label Telling the Truth? Posted on Monday, April 1st, 2019 at 2:51 pm. How do you know that what’s on your olive oil label is true? Don’t be fooled by fake olive oil. Read our guide and learn how to find an olive oil you can trust and freshness you can taste. you’ve heard in the media about fraud in the olive oil industry today. Misrepresenting or adulterating olive oil has been a lucrative — and illegal — business for thousands of years. In fact, cuneiform tablets in the twenty-fourth century B.C. — the earliest written reference to olive oil — record that teams of inspectors, looking for fraudulent practices, visited olive mills on behalf of the king. Today it’s organized crime that keeps investigators on their trail. And the Agro-Mafia, as it’s called, seems to be winning. According to a recent 60 Minutes story and an investigative report in the New Yorker magazine, in the United States today “70% of extra virgin olive oil is probably a fraud.” Extra virgin olive oil is time-consuming and costly to produce. Odds are, the olive oil labeled “extra virgin” currently in your kitchen might very well have been mixed with other oils. Or worse, it’s not olive oil at all, but a vegetable oil disguised with coloring and synthetic aroma. 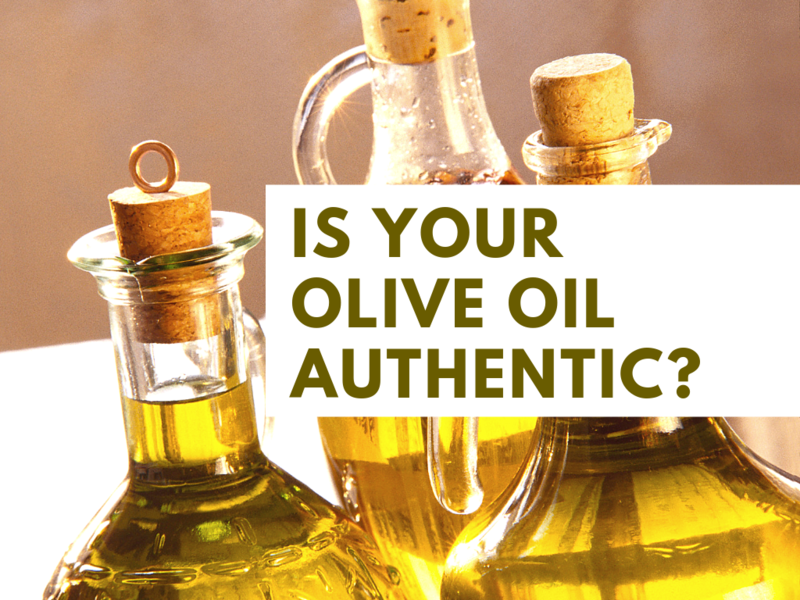 So how do you know that your olive oil is authentic? As a consumer, how can you be sure that the olive oil you use in your salads and sauté pan, in your pesto and pasta primavera is the real deal — 100% extra virgin olive oil with all the benefits that are naturally part of it? How do you know that bottle hasn’t been sitting stale on the grocer’s shelf for months? This guide will delve into those questions, starting with what makes extra virgin olive oil so special. The olive is actually a stone fruit, like a cherry. And real extra virgin olive oil is a lot like fresh-squeezed fruit juice — made from olives ideally picked by hand, milled within hours, and crushed by a simple hydraulic press or centrifuge. True extra virgin olive oil comes from the first pressing and is free of any defects. Unlike other cooking oils, it’s the only one made without the use of chemicals, heat, or industrial refining. contains natural antioxidants, including polyphenols — a type of antioxidant that helps protect cells from damage. “When companies taint the oil, consumers lose that wonderful cocktail of anti-inflammatories and antioxidants,” says journalist and industry expert, Tom Mueller. So can you get the real thing and the peace of mind that comes with it? Concerned about rampant EVOO fraud, olive oil lovers have been looking for ways to make sure they’re not getting ripped off. They’ve tried the “taste test,” the “fridge test,” and the “oil lamp test” but these do-it-yourself measures have been proven completely unreliable. Truthfully, there is only one way to be absolutely sure your olive oil is exta virgin . . .
A recent study done by the University of California Davis found that domestic olive oil from single producers or co-ops was always real. to bright to bold, and can range from subtle to intense. Each extra-virgin olive oil We Olive offers has been certified as “extra virgin” by the California Olive Oil Council. With the COOC seal, you know it’s real. • Each oil undergoes a chemical analysis that tests criteria for EVOO, including acidity levels. been cold-pressed and has an acidity level less than .5%. A 2010 study by researchers at the University of California, Davis, found that 69 percent of imported olive oil labeled “extra virgin” did not meet, in an expert taste and smell test, the standard for that label. Better than just genuine. Extraordinary. Olive we’ve gone – and regularly go — in search of only the finest olive oils the Golden State has to offer. We’ve chatted with California growers in the shade of their olive trees. Wiped the dust of the groves from the soles our shoes. And standing in the middle of many an artisan mill, breathed in the oh-so-wonderful aroma of the first pressing. EVOO from We Olive. Any foodie will tell you that tasting freshly pressed EVOO for the first time is transformational. The extra virgin olive oils you’ll find at We Olive you won’t typically find in supermarkets or discount warehouses or even in smaller upscale markets. The variety and quality of our EVOOs is rivaled only by how good they taste and how much they add to all kinds of recipes – from marinades to salad dressings, pastas to delicious dipping sauces. Whether you cook every day or lavishly when you entertain, let our EVOOs – some of them infused with flavors like basil or garlic or blood orange – take your favorite recipes to a whole new place.